SEMA attendees shouldn’t pass up a chance to enter and win the Spanesi Q5.2 Synergic Inverter MIG/MAG welding package being given away by the Society of Collision Repair Specialists and Spansei. The 208-230V, single-phase, double-pulse welder has settings for “most popular wires, thicknesses and material,” SCRS wrote. 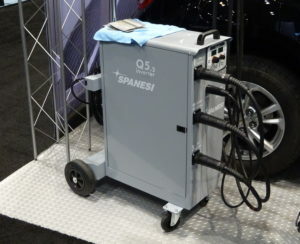 Spanesi said the welder also meets the Assured Performance requirements, which would make it approved for Ford, FCA, Nissan, Hyundai and soon Kia OEM certified shop networks. The drawing for the welder will be held at noon, Friday, Nov. 3, at the SCRS booth, North Hall No. 11173. To enter, you’ll need to do a little legwork. Then, visit each supporting company’s booth — which you were probably going to do anyway, judging by the sponsor lineup — and receive a stamp from that sponsor. Once you’ve collected all the sponsors’ stamps, drop the card off at the SCRS booth before 11:59 a.m. on Friday, Nov. 3, to enter the drawing. SCRS on Tuesday credited AkzoNobel; the Alliance of Automotive Service Providers; Audatex; Auto Care Association’s Paint, Body and Equipment Specialists arm; Axalta; BASF; CCC; Celette; DeBeer; Enterprise; Estify; Ford; General Motors; Honda; PPG; Pro Spot; Reliable Automotive Equipment; Sherwin-Williams; Spanesi; Speciality Equipment Market Association (SEMA); and Toyota. Details: www.scrs.com, 1-877-841-0660, info@scrs.com; and www.spanesi.com.